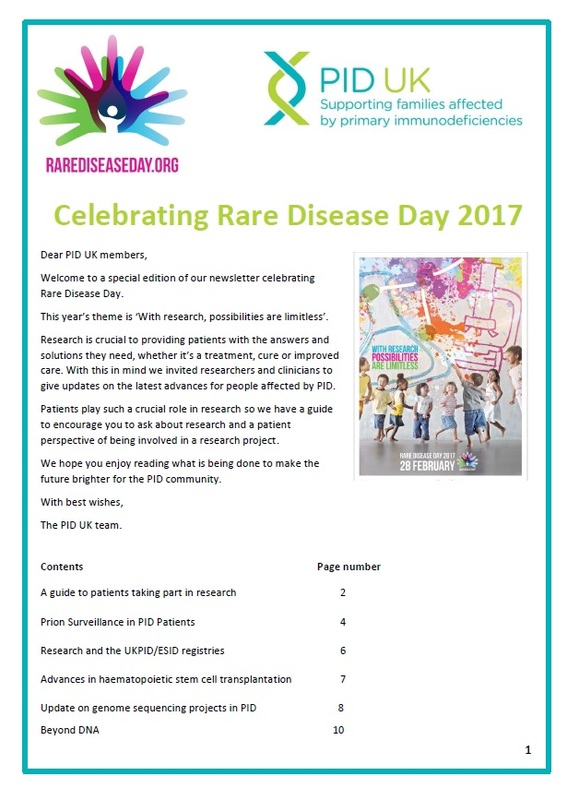 Primary Immunodeficiency UK (PID UK) celebrated Rare Diseases Day by issuing a special edition of their newsletter focused on research advances that benefit people affected by primary immunodeficiencies (PID). The newsletter included information on the use of PID patient registries as a research tool to understand the epidemiology of PIDs, advances in haematopoietic stem cell transplantation, genome sequencing and the prion surveillance project. There was also a guide to encourage the community to ask about their attending physician about research and a piece on a patient’s perspective of being involved in a research project. ‘This year’s (Rare Diseases Day) theme was ‘With research, possibilities are limitless’ and I felt this was a wonderful opportunity to tell our patient community of the many research projects that will help make the future brighter for the PID community and to encourage them to take part in research’, said Dr Susan Walsh, Director of PID UK.